We all know Beth Jacob is more than a place--it's a community. Whether we are engaging in study, working to promote justice in the wider society, or we're just out for a bike ride or a walk together, we want people to know that Beth Jacob is a great place to belong. 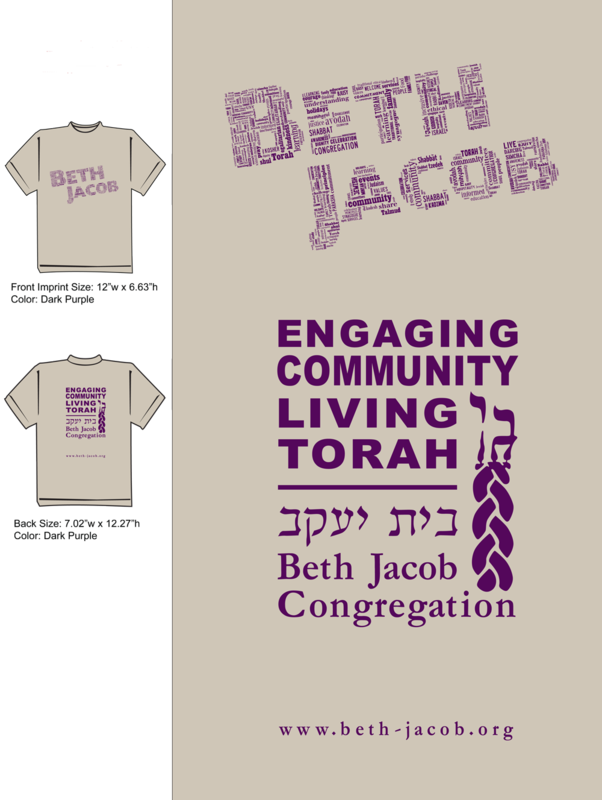 With that in mind, we've got some great news: we now have Beth Jacob t-shirts! We're keeping the price really low, only $5 per shirt, so everyone can get them. Come check them out in person and buy yours at the Thankukah Arts and Crafts Sale on Sunday, November 17th, or stop by the synagogue office any time after then. If ordering more than one shirt, use the "Participant 2, Participant 3 etc." fields.